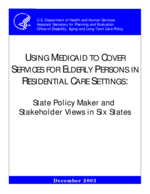 Using Medicaid to Cover Services for Elderly Persons in Residential Care Settings: State Policy Maker and Stakeholder Views in Six States. Personal Care Option or Waiver or Both? States can cover assisted living services through either a waiver program or the personal care option under the state plan or both. The waiver approach is advantageous in that states can broaden eligibility by using the 300 percent of SSI rule to reach persons in the community who would not ordinarily meet the financial qualifications for Medicaid. However, since waiver services are available only to beneficiaries who meet the state's nursing home level-of-care criteria, serving people through a waiver will target a more severely impaired population than is generally served through the personal care option. The waiver program also offers the advantage of predictable costs for states concerned about utilization of a new benefit. The combination of nursing facility level-of-care eligibility criteria, a set number of slots (as is permitted in a waiver program), and expenditure caps will limit the number of people potentially eligible. The personal care option is advantageous in that it will broaden eligibility by allowing a less severely impaired population to be served. This is because states may impose reasonable medical necessity criteria but may not restrict the benefit to persons who require a nursing home level of care. One disadvantage of using the personal care option is that it lacks the higher income eligibility standard used for waiver programs. When deciding which approach to use--or whether to use both--states may want to estimate how many people would be served under the different options in order to judge both the reach of the potential service and its likely cost.